A black and white photograph of W.J. Luke's bicycle shop. 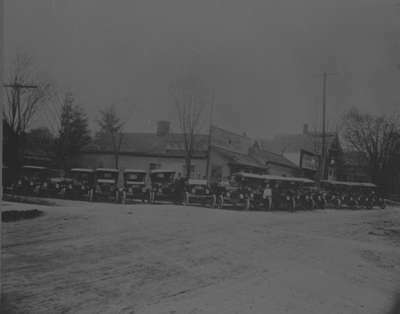 This picture shows the shop and garage with 16 Ford cars in front of it. The people in the photograph from left to right are: W.J. Luke, unidentified person, unidentified person, unidentified person, John Sawdon, unidentified person, unidentified person, unidentified person, unidentified person, unidentified person, John Lynde. W.J. Luke's bicycle shop was located at 301 Dundas Street West, on the southwest corner of Dundas and Centre Streets from 1901 to 1914. In 1915, the frame building was replaced by a brick garage. Mr. Luke became Whitby's first Ford car dealer in 1913. Signs on buildings from left to right "W.J. LUKE"; "W.J. LUKE REPAIR SHOP"; "BICYCLES AND REPAIR"
W.J. Luke Car Lot, 1913, Photographer Unknown. Whitby Archives 01-000-049.